Why is it so hard to eat healthy sometimes? The vegetables are in your refrigerator, your favorite ‘guilty pleasure’ lunch spot is closed for renovations… You’re even craving lettuce. But alas, your healthy lunch plans keep getting foiled. Today we’re here to solve one problem you might be having with your on-the-go salads: convenience. If you’ve ever experienced an explosion of balsamic at the bottom of your bag, you know what I mean. If you’ve ever toted 5 extra containers with you—because heaven forbid the ingredients mingle prematurely—you know what I mean. 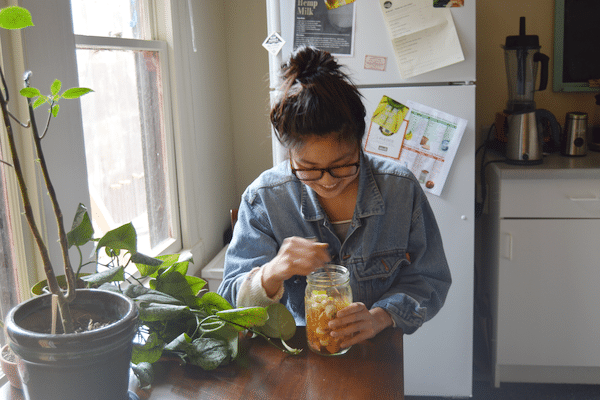 If mason jars haven’t already permeated your life, they’re about to. 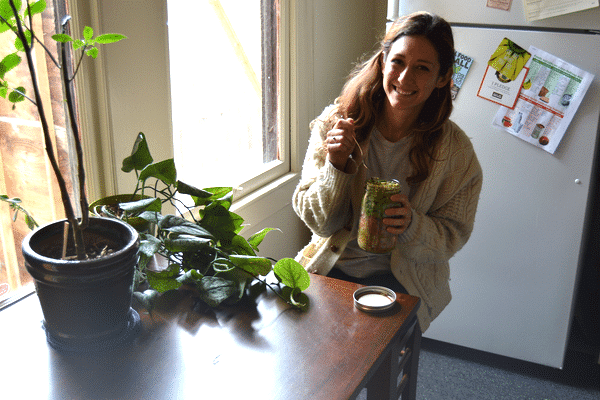 Ladies and gentlemen, we bring you salad in a jar. Let’s not sensationalize here: it’s just a convenient way to pack and store salads. 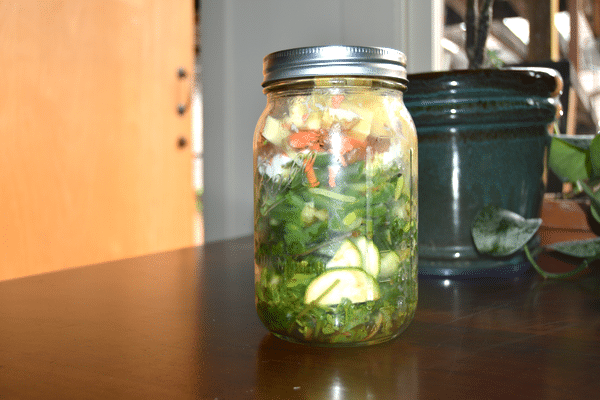 Refrigerated, your salad in a jar lasts up to five days. So you can make several on Sunday and enjoy them throughout the week. They store easily and stay fresh, turning your fridge into the ‘grab and go’ section of your favorite fast-casual restaurant. 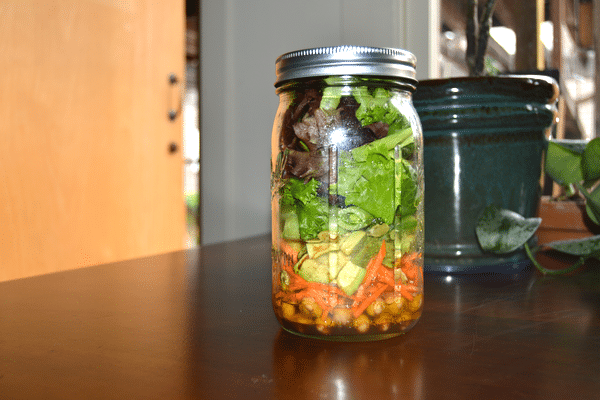 What makes salad in a jar different from just any old to-go salad situation is the layering, which allows you to put your greens and dressing in the same container without getting everything soggy. Pretty revolutionary. Wide-mouthed jars work the best, and quart-sized is good for a generous lunch or dinner portion. Pint-sized jars are good for smaller side salads. 1. Dressing first. Dressing goes on the bottom. As long as you don’t tip the jar over throughout the day, it’ll stay there! Use 1 – 4 tablespoons of your favorite dressing. 2. Add hard vegetables and fruits. These are ingredients that aren’t as absorbent or susceptible to sogginess: apples, carrots, roasted beets, cucumbers, bell peppers, etc. 3. Beans and grains. Your next layer could be chickpeas, black beans, edamame, corn… You get the idea. Adding beans and grains to your salad helps you stay full longer and (depending on what you put in there) can add a good dose of fiber. 4. Protein layer (optional). If you’re eating your salad the same day you’re making it, you can add tofu, cheese, meat, or fish. 5. Soft fruits and veggies. Now you add the delicate, absorbent ones: tomatoes, avocado, strawberries, etc. 6. Nuts and seeds. Add almonds, pumpkin seeds, walnuts, or any of your favorite nuts or seeds. Healthy fats are great for the skin! 7. The greens. It’s what we’re here for, folks. Add your greens last, safe and sound at the top of your jar where no dressing will find them until you say so. Kale, spinach, lettuce, arugula… You know what you like. We challenged our team to see what they could come up with. Each of us took home a jar and brought it back bursting with salad. Then we took photos of ourselves with them, because what's more photogenic than people eating salad? Put all ingredients in a blender and blend until smooth. Try substituting cilantro for basil! Note: This recipe makes enough dressing for several salads. You might have read our article about FODMAPs—they might be the reason you think you're gluten intolerant. Natalie realized that when she eliminated bread and other gluten products that she felt a lot better. But not completely better. What she and many others have discovered is that her issues were stemming from a wider food group: foods that contain FODMAPs. You can read more about FODMAPs here, or read on for Natalie's FODMAP-free salad recipe. 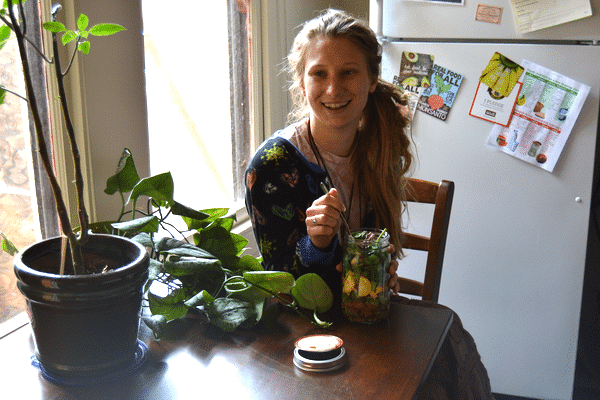 Chandra thought outside the greens with this one, packing a light and refreshing fruit salad into her jar. (She had actually just moved to Berkeley when we did this experiment, so her fridge was understandably unstocked.) Either way, it's still a salad in a jar! 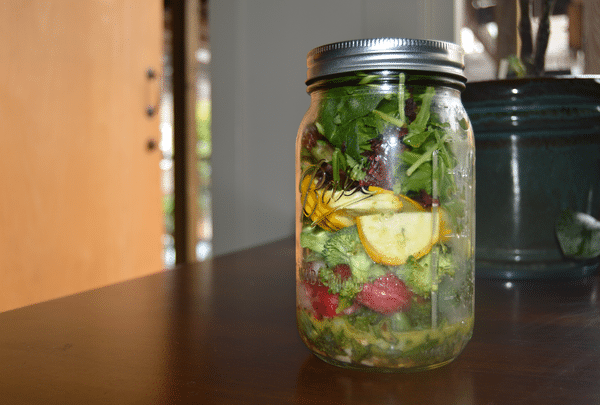 Have you tried salad in a jar? Comment with your thoughts or recipes below! P.S. We've moved offices since these photos were taken! Once we finish decorating, we're going to post photos! So happy to discover this fascinating website and your innovative ideas. Great idea! I have been hauling my salad and dressing in two different containers for months now. My dressing would invariably tip over in my lunchbox at least once a week, and coat my fork with olive oil. I haven’t been able to find a container small enough that wouldn’t leak. Now I don’t have to worry about that! I’m bringing up mason jars from the basement today! Wow! Thirst are incredible healthy salad recipes. Thank you so much for sharing. I am going to save them on my Pinteresr board to save them and will start shopping today to fill my frig with the ingredients. My thanks to the Anna Marie Gianni staff. Maybe I speed read this, by why dressing in the bottom of jar? This way you don’t have to carry multiple containers with you, just one just full of yummy salad. By putting the harder/less absorbant ingredients on the bottom, the leaves and softer ingredients on top don’t get soggy. This is such a neat idea, thanks for posting this. Can’t wait to try these. What a good idea! Thank you for your wonderful products and excellent information! I love Mason Jar Salads. My latest “love” is Tortellini with Basil Pesto, Cherry Tomatoes, and Mozzarella. Recipe is from an amazing book from Julia Mirabella called “MASON JAR SALADS and more”. Check it out on Amazon. And, thank you again for sending Kale and Coffee. I had preordered one from Amazon, but was thrilled to receive a second copy as last weekend I attended a plant walk at the Azalea Reserve, Humboldt County where we learned to identify native medicinal and edible herbs as well as ethical wildcrafting. This generated a conversation with one of my classmates about Annmarie’s skin care line and Kevin’s new book. She was eager to read “Kale and Coffee” but hadn’t yet purchased a copy (student with other books to purchase first) .Because of your thoughtfulness in sharing your book, I was able to give it to her. She was thrilled to receive it. Thanks from both of us. I have been a big fan of yours for a couple of years now and have lots of your products. Since I follow you I received your blog post about Salad in a Jar. I thought I had coined that phrase when I started doing this five years ago while trying to cure some health issues and lose some weight. 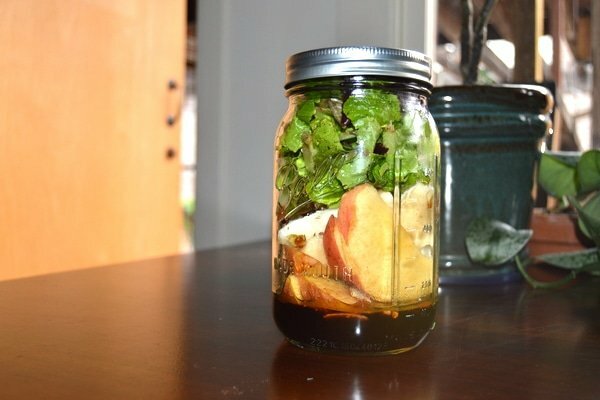 I would put my salad and dressing in a quart Ball jar and take it to work. So convenient. I have done it for years and even do it for breakfast with my yogurt, fresh fruit and homemade granola in a smaller jar. I have a blog on my website and am mentioning you and a link to your blog this week. I am small potatoes compared to where you are in the big blogosphere but I love what you put together and want my clients to know about you and your site. Thank you for promoting a healthy world. How many days in advance would you suggest this could be prepped? Up to 5 days can work, depending on the ingredients. If you’re using meat or other protein, I’d recommend eating it that day or perhaps the next. Hardy greens like kale keep better than softer lettuces. But in general, you could make these 4-5 days in advance if you wanted! I haven’t done one yet but what a great idea! Thanks for sharing all your variations. Your dressings sound great too! Bookmarking this page for future reference. What a great idea! I make big salads to take for dinner when I am working late. I put mine in 7 cup glass Pyrex dishes. Mine don’t have to sit for hours, though. I love the idea of the wide mouth Mason jars and layering as suggested. There are times I need to make salads in advance. Love the dressing ideas, too. My own recipe has (everything is OG) 1 part apple cider vinegar to two parts olive oil. Add Dijon mustard to taste. Add chopped, fresh garlic to taste – I use LOTS. Add a little water and a little red miso. Shake it well. I make 6 cups at a time and store it in 2 “salad dressing” glass bottles from 16 ounce kombucha drinks. Perfect size, great for pouring, and easy to clean and fill. This is great! Just emailed this to my daughter as she takes her lunch to work.